Note: This is a guest post from Casey Covel, whose work we’ve featured here a number of times through our Something More column. She’s editor-in-chief at Geeks Under Grace and goes by cutsceneaddict in the cosplay world. I hope you enjoy her submission…it’s the first of many from Casey that you’ll be seeing here on Beneath the Tangles. If you’re like me, you couldn’t wait until 2016 for the second season of Attack on Titan and scooped up the manga ASAP to pursue the story. If you’re not like me, and you have the patience of Job to wait on that elusive second season, then I suggest you avoid this article for the time being, as there are some rather titan-sized spoilers within. 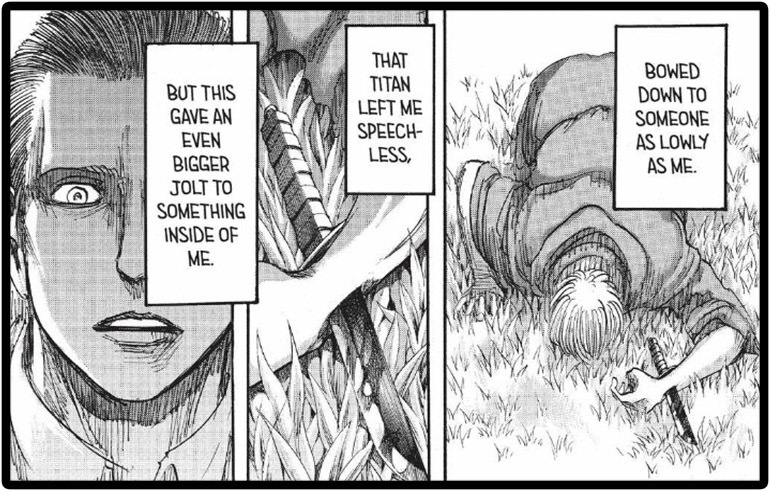 As I impatiently awaited this month’s new chapter, I found myself reflecting back on the landslide of storyline from Attack on Titan chapter 69. Amidst such plot-relevant giants as the revelation of Levi’s childhood, the crowning of Queen Historia, and death of a certain ornery uncle, Kenny’s relationship with Uri is nearly forgotten. Admittedly, though, it’s perhaps the one reveal in the chapter that haunted me long after reading. As a Christian, I can only say that’s because it resonated with my faith so frighteningly well. In chapter 69, it’s revealed that Kenny, having discovered Uri’s identity as true king of the human race, tried to kill him, but Uri initiated his titan form and caught his would-be assassinator off-guard, capturing him in a deadly fist. Despite Rod’s demands that Uri crush Kenny then and there, however, Uri released him and—even as Kenny pierced the king through the wrist with his blade—bowed hands-and-knees to his attacker, asking Kenny for forgiveness for the genocide of the Ackerman line. This act of humility so affected Kenny that he found himself unable to end his enemy’s life, even with Uri face-down on the ground and his finger ready on the trigger. Kenny and Uri went on to form an inseparable bond of friendship. All the while, Kenny’s insatiable curiosity for Uri’s unique ideology continued to grow. By the time of Uri’s death, Kenny had not yet unlocked the mystery of his friend’s inner strength, but—determined to achieve it for himself—went about seeking fulfillment in other ways in order to acquire Uri’s “power.” Gaining notoriety as a serial killer to preserve his family, raising his deceased sister’s child, earning a captain’s rank within the Military Police, striving to attain the power of a titan shifter and, thus, a god—all these routes Kenny pursued, and all of them left him unsatisfactorily empty. Flashing forward to the present, Levi comes across a wounded Kenny—now burned and bleeding beyond saving—following his encounter with Rod Reiss. The two hold a final conversation, in which Kenny ponders the motivations of those he’s met throughout his life. “They all had something they were drunk on,” he concludes. I find it fascinating that this word drunk is specifically used here because it means to be “dominated by an intense feeling” to the point of “behaving in an unusual or improper way.” Furthermore, I think it’s a highly-appropriate word to describe the state of our world today, outside of Christ. We live in a restless world—one that seeks to attain peace and fulfillment through a variety of outlets. Human beings are born with an instinct to worship—to fully dedicate themselves to something or someone, even if it is ultimately their own selves. Until we come to Christ, we carry a God-shaped hole in our beings—one that cannot be filled by anything else, and yet one that we continuously try to fill with worldly things (which can only satisfy us for a short amount of time). Few would argue that dedicating your life fully to the pursuit of alcohol would be a poor way to spend your time on earth, but what about the pursuit of seemingly noble, good things like family, children, or loyalty to one’s king? The Bible says we are to honor our rulers (Romans 13:7) and love and provide for our families (1 Timothy 5:8), but also makes it very clear that seeking peace and fulfillment in the things of the world—be that in people, status, goals, or material possessions—will leave us empty, outside of Christ. While we remain lost, we search for something to fully dedicate ourselves to—to be “drunk on,” as Kenny says, and “keep us moving.” But God doesn’t want to give us something just to “keep us moving,” as though life is something to be endured; He wants us to “begin living” in the joy of His salvation. Only in dying to ourselves and to the things of the world can we begin to fully realize the life we were meant to experience—not a hardship, but a divine journey—and fill our spiritual emptiness. In his final moments, Kenny knows that he’s missing something in his life, and his unquenchable desire for Uri’s “power” is among his final thoughts. He begins to wonder if perhaps someone like him—someone who has lived amongst the lowest of humanity, who has cheated, stolen, and murdered his way to the top—is even capable of attaining “the view” that Uri possessed. 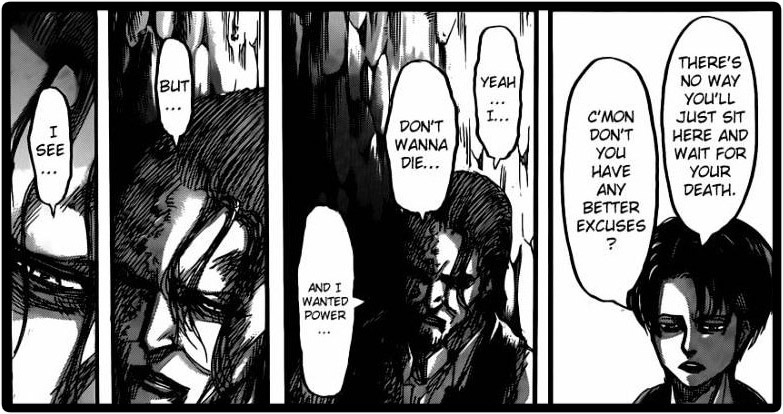 Kenny doesn’t want to die and tells Levi as much: he’s afraid to have lived a pointless life—one in which he was unable to attain the “power” he sought. Having stolen a vial of the titan-shifting serum from Rod Reiss, Kenny plans to inject himself in order to survive a little longer… even if it means becoming a mindless, stupid titan in the process. But the long-lingering image of Uri, kneeling humbly before him, begging forgiveness, stops Kenny. He hardly knows why. Something in Uri’s life continues to inspire him to seek something greater than himself—to stop grasping at meaningless mirages—and it’s then that Kenny has a moment of realization. Kenny, at the end of his life, finally realizes this concept: that man will always be a slave to something. Looking back over the lives of his contemporaries, he’s able to pinpoint specific Masters that drove them—alcohol, women, family, dreams—and yet, even when he makes the connection that Uri, also, was a slave to something, Kenny is unable to put a name on it—perhaps because it’s something much bigger than Kenny could ever realize. Kenny looks back at Uri’s sacrifice and forgiveness and is inspired to do the same. Having found the secret to Uri’s “power,” Kenny makes peace with his nephew and at last lets go of his desire to find further fulfillment in his life. 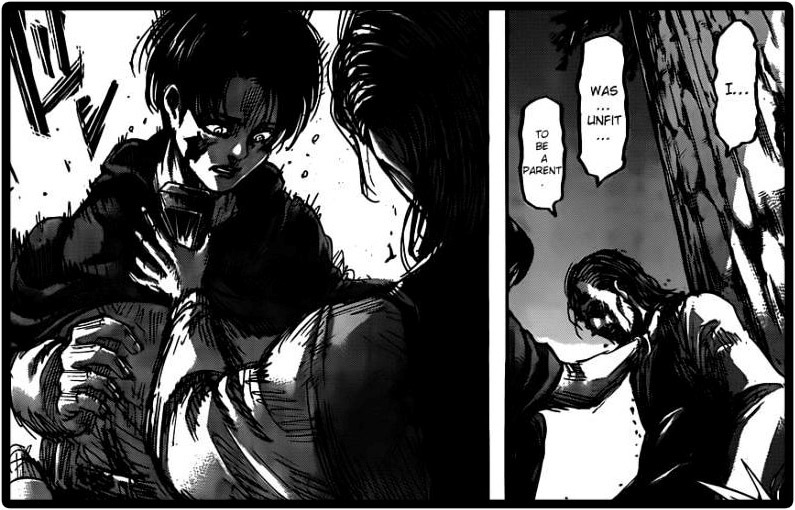 In essence, he repays Uri’s kindness by sacrificing his own life in order to give Levi the titan shifter serum—the same serum that might have prolonged his own existence. Kenny’s last words are an admittance of his short-comings… and an unstated plea for forgiveness. In a 21st century world permeated with social media, live news reports, world-wide interconnectivity, and modern day technology, we are more in-tune than ever to the gnawing pain of emptiness and the cries of unfulfilled lives (Ecclesiastes 1:3-4). People around the globe—even people who have heard the message of Christ, but never taken His words to heart—are enslaving themselves to all manner of mortal things to find acceptance and fulfillment. Jesus left his disciples with a challenge—a holy mission—to take the Gospel to the “uttermost part of the earth” (Acts 1:8). As Christians, a part of that mission entails being a representative of Christ on earth—to the point that others can literally see the love, peace, and glory of God reflected through us. Much like Uri, we should be able to stop the world in its tracks with our nonconformity—loving and forgiving when the world demands that we hate and despise. Had Uri taken Kenny’s life instead of showing him mercy, much of the story would have turned out very differently… and perhaps certain characters—including Eren—wouldn’t have even survived. Most importantly, though, Kenny is able to find guidance through Uri—to see a bigger picture and aim to achieve something beyond his selfish desires. In his final moments, Kenny finds the peace he’s been searching for all his life, as well as the strength to admit his wrongs and ask forgiveness of his last surviving family member. It is not Kenny’s pursuit of alcohol, power, dreams, or even family that brings him to this point of fulfillment. It is his comprehension of Uri’s sacrifice and kindness that inspires him to let go of the superficial and reach for something deeper. When we accept Christ’s offer of salvation, we experience the same sort of fulfillment. The Bible promises that all those who come to God will be accepted (John 6:27) and receive a new life (2 Corinthians 5:17). Furthermore, God promises to meet our needs and mend our spiritual emptiness. Awesome stuff Casey! I read that chapter and noticed that convo with Kenny as well but didn’t glean the wisdom you did from it so it was an interesting read 🙂 I do believe just as you stated that people are always looking for that “something” that will fulfill them. I like to say as a Christian that I “have the t-shirt” of life and have only found that peace in Christ. I’ve tried it with money, material things, being married, having my own home etc. It’s GREAT and all these things are blessings from my Father in Heaven, but without Christ I would still be empty with them all. I am so thankful daily for His hand over our life and I have the answer that everyone is looking for, and that answer is Jesus Christ. Thanks for sharing. I will say, though, that this is actually a guest post from Casey! Oh wow sorry! I didn’t read that part, I just saw at the bottom your profile pic so….I will edit my post haha. Thanks Casey! Great post by the way!!! It’s OK TWWK 😉 You can take 20% of the credit, so long as it’s paid with interest. Haha, thanks Samuru! ^^)/ This one was fun to write, mainly because truths kept hitting me in the face as I went. It started out as a piece based around “vanity” (see Ecclesiastes 1) and then it turned into this 2,000-word monstrosity. I’m grateful that you were able to glean something from it, and appreciate the thoughtful comment 🙂 I think everyone who’s ever come to the point of accepting Christ has tried to “fill the emptiness” with all manner of “somethings,” but, as you said, find that they can’t be fulfilled through anything else but Him.